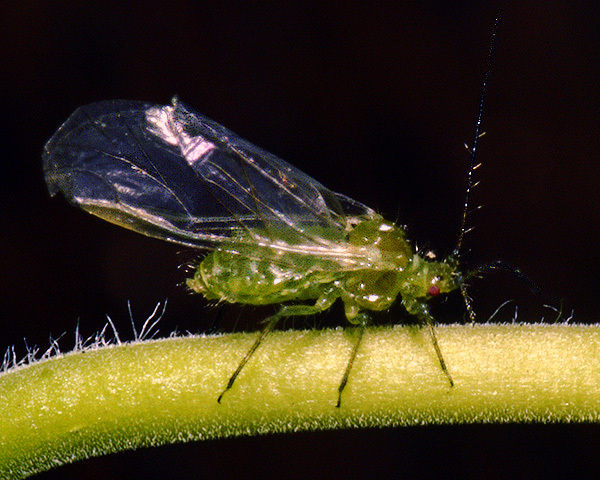 Periphyllus are medium-sized to large elongate oval or pear-shaped aphids which may be winged or wingless. The dorsum is mainly membranous (unsclerotized) but there are many small hair-bearing plates. The siphunculi are stump-shaped with a pronounced flange. The cauda at the tip of the abdomen is either rounded or tongue-shaped with a slight constriction. Antennal hairs are usually long and conspicuous. 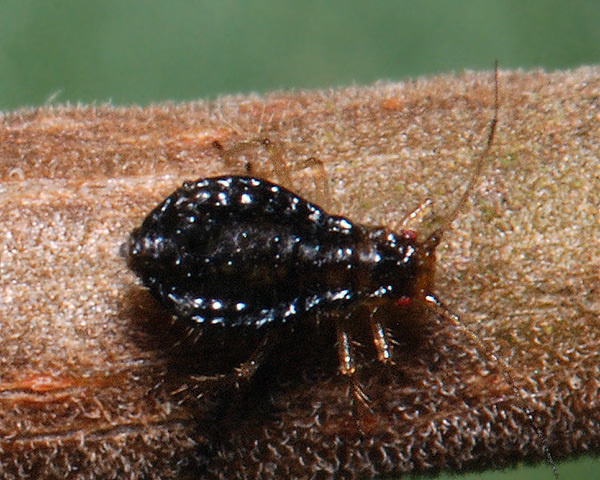 There are about 42 species of Periphyllus aphids mostly living on maples and sycamore (Acer spp) in the Aceraceae. They have a sexual stage in the life cycle, but do not host alternate. Some species are usually ant-attended. They show seasonal polymorphism to cope with physiological changes in the host with several species having an aestivating nymphal stage which is often flattened and hairy. Adult Periphyllus acericola apterae are pale green or yellowish green, with darker green flecks and sometimes with dorsal brownish markings (see first picture below). The tips of the antennal segments are dark and the terminal process is 2.3 - 3.0 times longer than the base of the last antennal segment. The longer of the two hairs on the base of antennal segment VI is more than half as long as the base of antennal segment VI (cf. 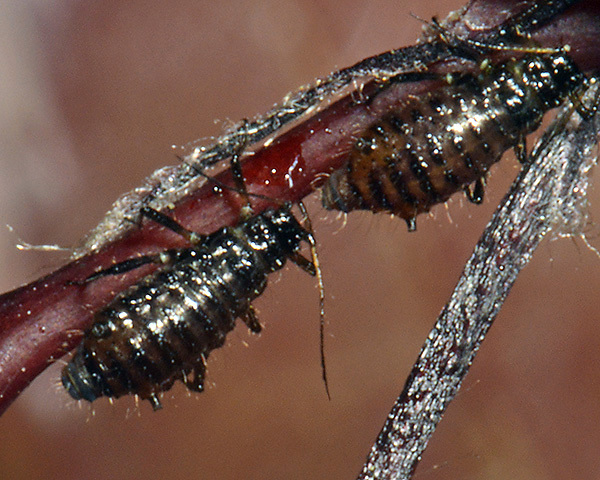 Periphyllus testudinaceus and Periphyllus californiensis which have the longer of the two hairs on the base of antennal segment VI less than half as long as the base of antennal segment VI) . The head and pronotum are pale as are the legs and the siphunculi. The siphunculi are stump shaped, their lengths a little less than their basal diameters. The width of the base of the cauda is more than twice the length of the cauda. The adult Periphyllus acericola aptera body length is 2.4-3.5 mm. Note: it is much easier to confirm identification on the alates (see below) than on the apterae. Periphyllus acericola alates (see second picture above) have broad dark dorsal abdominal cross-bars scarcely separated between segments. The pterostigmata of the wings are very black and darker than the marginal sclerites (cf. Periphyllus testudinaceus which has the pterostigma of the wing paler than the marginal sclerites). The adult alate body length is 3.0-3.5 mm. The Periphyllus acericola fundatrix is greenish-brown and strongly hairy with numerous black tubercles. It is unusually large, with a body length of up to 4.5 mm. 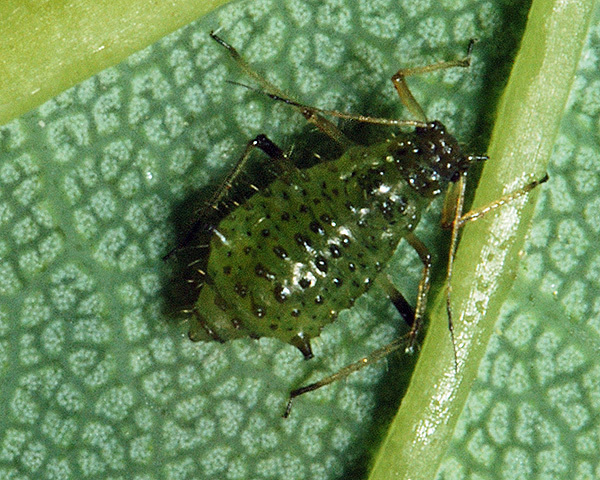 The sycamore periphyllus aphid is found on the undersides of leaves, petioles and young shoots of Sycamore (Acer pseudoplatanus). It is sometimes attended by ants. Periphyllus acericola is found through most of Europe. 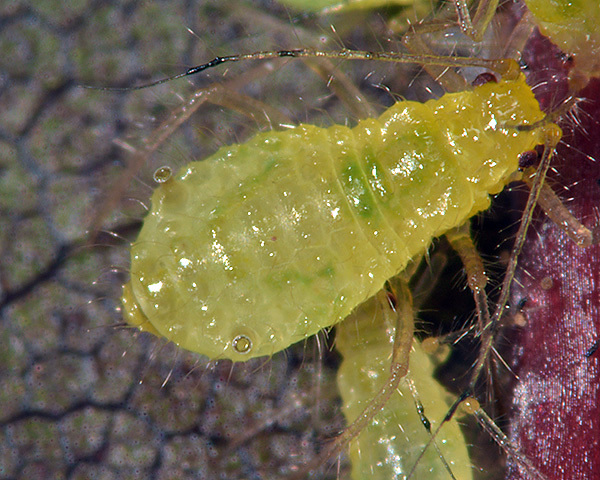 Periphyllus aceris apterae are yellow with green flecks dorsally (see first picture below). The head, pronotum and legs (except tarsi) are pale (cf. Periphyllus testudinaceus which has the hind tibia with a pale middle region contrasting with a dark base and distal section). The antennae have a terminal process that is 2.2-2.7 times as long as the last antennal segment. The siphunculi are pale and short - about 2.1 - 2.5 times as long as the cauda. The cauda is broadly rounded and distinctly shorter than the width of its base (cf. Periphyllus lyropictus which has a tongue-shaped cauda, about as long as broad). The body length is 1.5-3.7 mm. Periphyllus species are most readily differentiated using characters on the alates. Periphyllus aceris alates (see second picture above) have widely separated dorsal cross-bands (cf. Periphyllus acericola alates which have broad dark dorsal abdominal cross-bars scarcely separated between segments). The marginal sclerites and the pterostigma are equally dark (cf. Periphyllus testudinaceus which has the cross-bands and marginal sclerites darker than the light brown pterostigma of the wing). The alate body length is 3.2-4.5 mm. Periphyllus aceris lives on the undersides of leaves, petioles and growing shoots of Acer species, especially Acer platanoides (Norway maple). It is not usually attended by ants. The species is found throughout most of Europe, but has apparently not so far established itself in North America. Periphyllus californiensis apterae (see first picture below) are reddish brown to dark olive-green. The length of the antennae is about 0.6 times the body length, with the terminal process about twice as long as the last antennal segment.The broken dorsal cross bands are dark as are the head, pronotum, and siphunculi. The siphunculi are about as long as the second hind tarsal segment. The hind femur and tibia are uniformly dark (cf. Periphyllus testudinaceus where the tibiae have a very pale middle section which contrasts with their dark base and tip). The cauda is broadly rounded with 8-12 hairs. The body length is 2-3 mm. Periphyllus californiensis alates (see second picture above) have dark bands across abdominal tergites, apparently darker than the pterostigma. 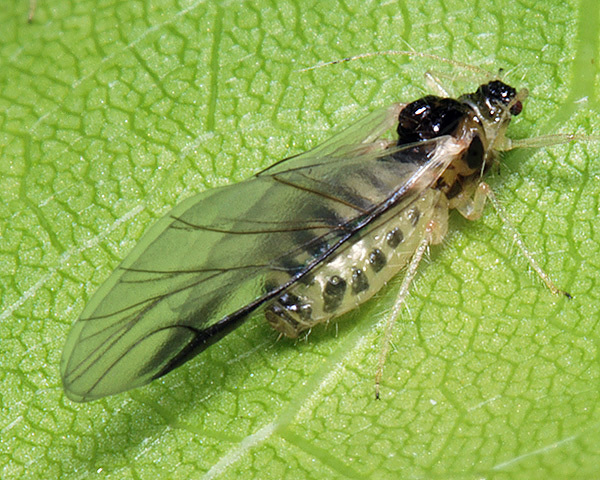 The Californian maple aphid is not indigenous to Europe (nor to California), but is from East Asia. Periphyllus californiensis has proved highly invasive and has spread to Europe, North America, Australia and New Zealand on planted Asian ornamental maples such as smooth Japanese maple (Acer palmatum) and downy Japanese maple (Acer japonicum). 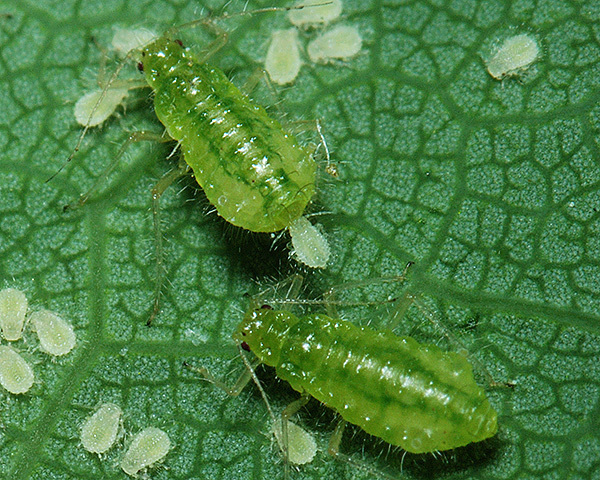 Periphyllus hirticonis apterae are light green or yellow-green with red eyes and no dark markings. The antennae are 0.7 times the body length, and have a terminal process that is 5 times as long as the last antennal segment. The two hairs on the base of antennal segment 6 are very unequal in length with the longer more than 4 times as long as the shorter (cf. 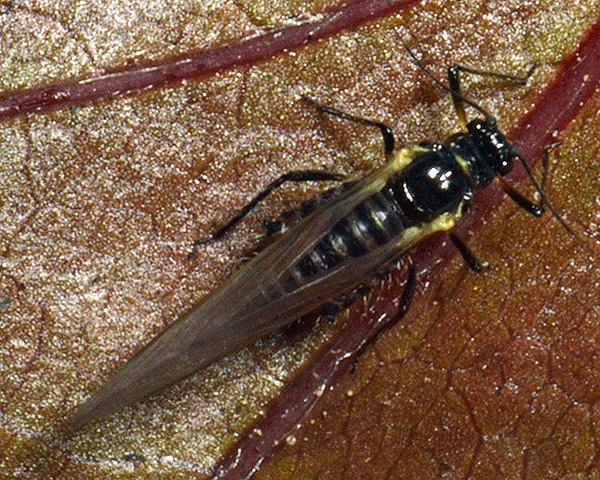 Periphyllus obscurus which has the two hairs on the base of antennal segment 6 both long and fine, the longer one being 1.3-3.0 times the shorter). Some dorsal hairs have forked apices. The siphunculi are pale, longer than the second hind tarsal segment and strongly flared at the apex. The cauda is knobbed with 6-8 hairs, and is more than half as long as its basal width. The body length is 2-3 mm. Periphyllus hirticornis alates are bright green with variably developed marginal plates, no dorsal cross bands, and brownish siphunculi and cauda. 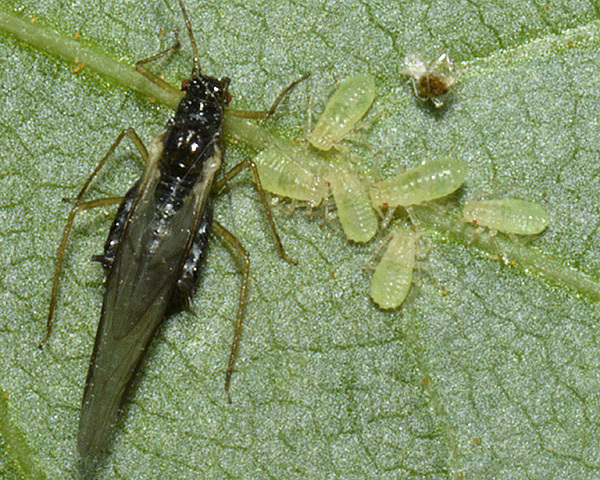 The green maple periphyllus aphid lives on the undersides of young leaves, leaf petioles and developing seeds of field maple (Acer campestre). 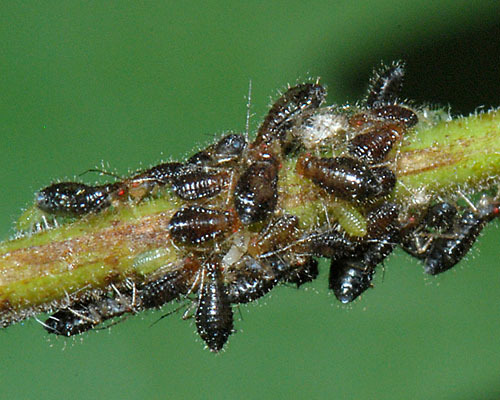 Colonies are often attended by ants. Aestivating nymphs with foliate marginal hairs are present in summer. 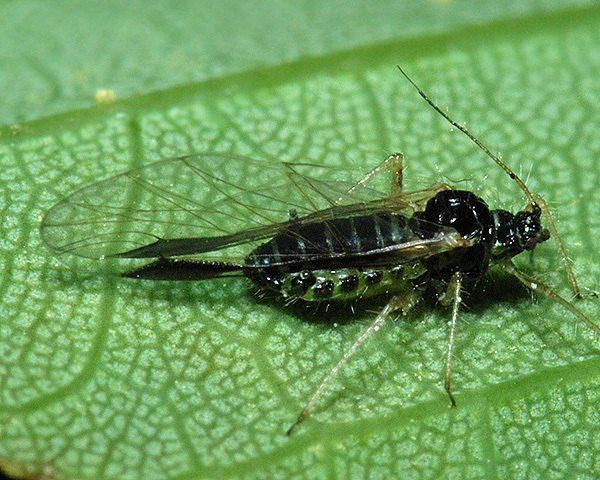 Oviparae and alate males are produced in October-November. The species is widely distributed in Europe. Periphyllus lyropictus alatae (see second picture above) have dark marginal sclerites, but other dorsal sclerotization is limited to the spinal area, not forming cross-bands. The shorter hair on the basal part of the sixth antennal segment is 0.025-0.04 mm long (cf. Periphyllus hirticornis which has this hair 0.019-0.025 mm long). The siphunculi are 0.17-0.23 mm long (cf. Periphyllus hirticornis where the siphunculi are 0.21-0.28 mm long). Periphyllus testudinaceus apterae are dirty dark green to dark brown or blackish and have a clear pattern of dark abdominal sclerites (see first picture below). The antennae have a terminal process that is 2.5-3.7 times as long as the last antennal segment. The siphunculi are brown and short. The tibiae have a very pale middle section which contrasts with their dark base and tip (cf. 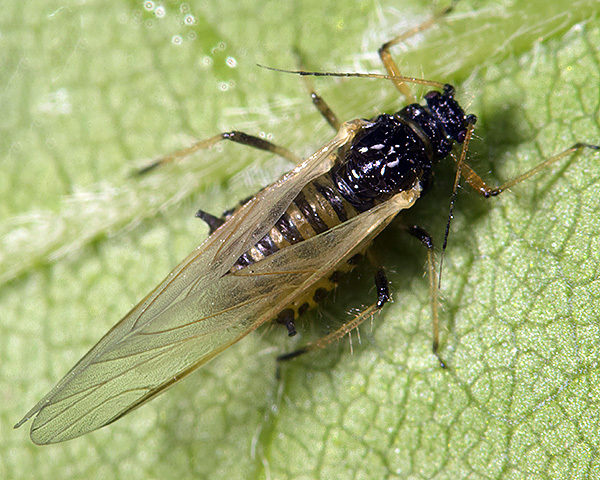 Periphyllus obscurus which has tibiae which are are more or less pale throughout). The cauda is twice as broad as long. The body length of Periphyllus testudinaceus is 2.0-3.7 mm. Periphyllus testudinaceus alates (see second picture above) have dark dorsal abdominal cross-bands and marginal sclerites, which are darker than the light brown pterostigma of the wing (see second picture above). 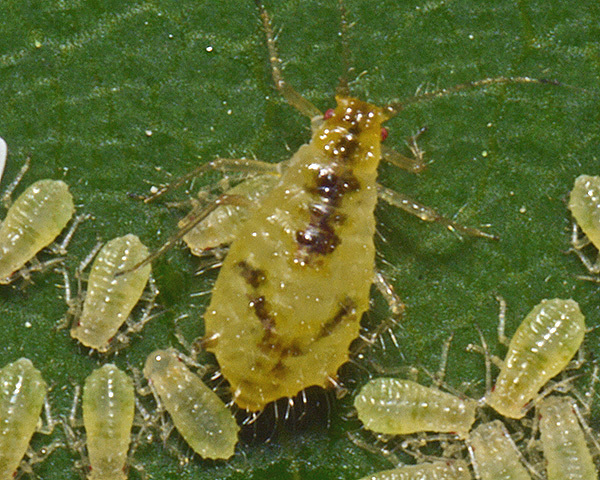 The common periphyllus aphid is found on the young growth, leaves and leaf petioles of various Maple species (Aceraceae) including Field Maple (Acer campestre), Norway Maple (Acer platanoides) and Sycamore (Acer pseudoplanatus) as well as sometimes on Horse Chestnut (Aesculus hippocastaneum). It is often attended by ants. Periphyllus testudinaceus is found throughout Europe and has been introduced to other parts of the world including New Zealand and North America.